Do you have a congested kitchen area? Can’t you find a place to put your microwave? We are here for you. For small families and limited space in your kitchen, we brought 10 best small microwave that will not only satisfy your needs in the kitchen but also fit in the small space on your shelf or table. See these amazing small microwaves with their detailed review containing their features, pros, and cons. Read the buying guide to know what makes a small microwave best suited for your kitchen. This microwave takes little time to cook. The door opening button is little tight. Whenever people hear this name RCA, the only thing they can think is a product of high-quality construction with low-price. 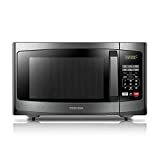 Like almost every product on this list, RCA RMW733 black microwave comes with some amazing features, 700-watt output, 10 power levels, and child lock feature also has cubic foot and electric touchpad. This small microwave is heavily constructed and the price is good according to features. It comes in black color, which is soothing to the eye. If you have a very modern kitchen this small microwave will perfectly suit with it. You can use it on your kitchen countertop, it will look outstanding. This microwave can warm foods faster. Comes with a centered heat radiation. Comes with a child lock feature. For beginners using this microwave will be little tough. Operating Frigidaire FFCM0724LB Countertop microwave is very easy. By just pressing the one-touch button you can get your foods cooked. For adjusting time, you only need to click the button once and cooking time will be expanded by 30 seconds. This small microwave also comes in black color and weigh of this microwave is 22 pounds and the dimensions are 13 x 17 x 10.1 inches. It comes with 10 power levels which help to prepare anything from frozen pizza to pot roast easily with less time. It has a glass turntable that provides a level cooking surface which helps to cook food evenly and by effortless defrost this microwave can easily defrost maximum thing consistently. This small microwave is an energy saver. Bringing this Bella 700-Watt Compact Microwave Oven to your kitchen means you bought a touch of fun and style to your kitchen. This microwave oven offers 700-watt power and 10 power levels for faster food cooking. It comes with a removable turntable of 10-inch which ensures even heating to food. Bella 700-Watt Microwave Oven has a modern interface with an LED clock and timer. It also has some outstanding features like 1 to 6-minute express cooking controls, one-touch cooking, comfortable +30 second control and 6 quick starts One-touch cooking feature for popcorns. Bella microwave oven allows multi-stage cooking which controls power level during the cooking cycle for better control and comes with a memory function with that user can save and recall custom controls. Looks cute on the countertop. Comes with a memory function. The design of this Whirlpool Black Countertop Microwave is really unique. It comes in black color and the dimensions are 13.8 x 15.4 x 14.1 inch. But it only weighs 33 pounds. This microwave can fit perfectly in corners. If you have a really small kitchen then this Whirlpool microwave will be perfect for you. It has a large glass turntable compared to other standard microwaves, comes with 750-watt power and ten power levels and quick touch button for popcorns. This Whirlpool microwave also has blue LED display, an integrated handle, and console. Cleaning this microwave is also very easy. According to features, the price is good. The fan of this microwave makes little noise. The Panasonic NE-1054F Microwave Oven is a perfect option for restaurants. This microwave oven has 1000-watt power, means it can prepare foods fast enough, which a very busy restaurants need. Some features of this microwave are, it has 0.8 cubic feet where dinner plates accommodate without any hassle, two coffee mugs, few glass bowls, has some large casserole dishes, and some normal kitchenware that needs for heating and cooking. This microwave has a unique door handle and comes with Touch-control keypad. To cook foods, you have to select from the electronic touch control keypad that comes with 10 programmable memory pads. Opening the door can be done with just one finger. Comes with some ordinary kitchenware. Some people get tired of wasting money on expensive microwaves which don’t last more than one or two years, this RCA RMW741 Cubic Foot Microwave is for those. This microwave is very durable and affordable altogether. It has large 0.7 cubic foot, ten cooking power levels by which users will be able to control the heat level depending on different types of food they are cooking. This microwave is an energy saver, users can save huge electricity bills by bringing this microwave home. Dimensions of this microwave are 18.5 x 14.2 x 11 inch and the weight is 25 pounds. Like other models, it also has 6 One-touch cooking menu, cook by weight and glass turntable. The Hamilton Beach 0.7MicrowaveOven is for people who want a LED screen display on their microwave. It also has ten power level user can choose any depending on the food they are cooking, Weight defrost option which helps this microwave to defrost almost everything and it comes in various beautiful colors. For frozen meats, it has time defrost function and 1.1 spaces inside, so it can accommodate a large number of foods to cook. This Hamilton microwave has 1000-watt power so it can cook or heat foods quickly and easily. Some microwave makes irritating noises when they are in use but this Hamilton microwave doesn’t make any noise when operating. The turntable is also very easy to use and clean also. People who don’t have much space at home, for them this Hamilton microwave is a perfect solution, this microwave doesn’t require much space. Things that keep the Daewoo Retro Microwave Oven from other microwaves are Style, performance and affordable price. This Daewoo microwave looks classy and the color is very adorable. It has a function calls Zero-Standby, Two-way defrost with this feature defrosting anything is just a matter of five minutes, also has Five power levels up to 700-watt users have to select these power levels by depending on their foods. As you can see the maximum power of this microwave is 700-watts so it won’t consume much electricity. Using and cleaning this machine both are very easy. The unique feature of this Daewoo microwave is, it has four auto cook menus that never disappoint food-lovers. This microwave is built with high-quality materials so it’s very durable and it will last for very long. Dimensions of this microwave are 17.6 x 10.6 x 12.7 inch. The Panasonic Countertop Microwave is the second best small microwave in our 10 best small microwave reviews. It has a stainless steel door and silver wrap comes with an inverter and has 1200-watt power. It will look stylish on any kitchen countertop. This microwave has a large 13.25-inch turntable that evenly heats food. As mentioned earlier, it comes with an inverter technology that makes sure there is temperature consistency which will help food to cook fully and edges don’t get overcooked. It has some other features also like, it comes with an Inverter Turbo Defrost function that helps this microwave to defrost faster, has a child lock feature, blue LED display screen and One-touch control obviously. The weight of this Panasonic microwave is 29 pounds and dimensions are 15.8 x 20.7 x 12.2 inches. Finally, the wait is over, here we have Westinghouse WCM660W 600-Watt Micro Oven. This microwave is priced moderately and packed with many useful features. It comes with six cooking power level, 9.5-inch turntable where a good amount of foods can accommodate for cooking, and this microwave is very easy to clean & simple to use. 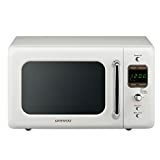 This Microwave has 0.6 cubic foot, removable glass turntable which is also very easy to use and clean up when you are done the cooking or heating foods. It also has a 30-minute timer which adds more heat to food. Westinghouse Microwave Oven has 600-watt power which is very energy saving for users. 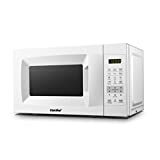 If you have a very small apartment and looking for stylish, durable and affordable microwave oven then you can purchase this one with no tension. If you are looking for a small microwave you already have one of the most important features that are the size of the microwave. If you are willing to buy a small one, it’s because either space you have set to place it is small or because you live alone and do not require a large microwave that consumes a lot of energy when using it. Whatever the reason, here we are pointing out the most important facts with which a good microwave must comply, even if it is a small one. The power of a microwave is the ability of the equipment to perform a function, whether thawing, grating or heating. The higher the power, the less time for cooking is required. The power of a microwave is measured in watts that are represented by the letter: W. The power range of a microwave can range from 700 W to 950 W, and usually the equipment with power between 700 and 800 W have from 2 up to 5 power levels. It is essential to know the power of the product and the levels it brings since not all foods or recipes require the same power to heat, cook or defrost. That is why you should choose a product with regular power capacity (from 700 to 800 W) and up to 5 power levels. 5 Power level will guarantee 5 different ways to for microwave functions. The main functions of a microwave are: reheat, defrost and grill. In microwave or self-cooking mode, we can cook the food. Sometimes, it can be confused with the reheat function, since some products bring the functions separately. But basically, it could be the same function, for cooking and reheating. The difference will depend on the time of each food and the power of the equipment. The function of defrosting exerts the action on a food so that it loses the freezing state, like for example the meats that we keep in the refrigerator. Another function is the grilling, which makes your food grilled or toast. This number refers to two types of dimensions, the one that the product has externally and the one that it has internally. The capacity is the maximum dimensions that we have inside the microwave, which is measured in liters. Another indicator of the internal proportions is the diameter of the turntable, whose range could be: 25 to 30 cm. Measures in horizontal and vertical that you should keep in mind when you want to enter an object with dimensions that exceed the maximum microwave measurements. The standard for small microwaves is 20 to 23 liters. The measurements of the space where we are going to put the microwave should be higher than the measures included in it since you must leave plenty of room for the necessary ventilation. The standard measurements of a small microwave are in the range of 35.8 x 43.9 x 25.8 cm and 38.5 x 48.5 x 28 cm. Interior light: the Internal light of the microwave is very important to see and track the food while they are cooking, heating or thawing. Built-in screen: In this screen, you can see the functions you select and their respective times. The kitchen clock is usually displayed and programmed on the screen. 2017 eathealthyandthrive.com. All rights reserved.